Bold. Innovative. Collaborative. Creative. Compelling. Crucial. Ambitious. Catalytic. Breakthrough. These words are loaded. They’re big-picture, vision-oriented. But what do they mean when we’re talking about ideas that elevate the quality of life in Allen County? In our last blog, we closed with a TED Talk—“The Unexpected Benefit of Celebrating Failure” by Astro Teller. We did so because we want to share inspiring, out-of-the-box ideas. But we’re not necessarily looking for the invention of the next self-driving car with the Breakthrough Fund. Breakthrough-level ideas address social issues in a way that hasn't been done before. We like that TED Talk for its acknowledgement of failure as a step to create success—which is the philosophy we’re challenging you to embrace with this grant opportunity. With our Breakthrough Fund, we’re not only giving you permission to fail, we’re daring you to. It’s human nature to shy away from the idea or project that best addresses a critical challenge, because it’s usually the one that runs the greatest risk of failure and takes the most resources. A new, game-changing idea takes time, brainpower and money to cultivate—and that tends to take more resources than any one organization can afford, especially in the nonprofit sector. But this may be the sector that needs it most; it’s the sector that creates change and lasting impact for our most crucial social issues. We believe that when nonprofit organizations partner, they can create incredible, unexpected and effective solutions for our community. Their combined resources and ideas create bigger impact than working alone. And when they partner for breakthrough ideas, without having to worry about resources, the results will net a better Allen County. Organizations must collaborate their applications, with a 501(c)3 as the lead. In the spirit of dreaming big, we encourage you to take a step away from predictability, even in choosing a partner. Two (or more) organizations (and only one needs to be a 501(c)3 public charity—see the full applicant criteria) who partner can be from any sector—health services, social services, education, art, economic development and so on—a breakthrough idea can, and should, intersect. So, partner up, and give yourself some room to dream. Will this idea address a social issue in Allen County? Is it important? Is it measureable? Is it feasible? Is it crucial? You don’t have to have a fully-fledged, shatterproof idea; we’d rather you didn’t. That’s what the Refine Phase is all about. Yes, we want you to demonstrate that your organization has a history of success, with a track record of responsible stewardship of your resources. But more so, we want you to explore what you would do with resources to do it. Those chosen for the Refine Phase will be given necessary resources to ply, distort, twist—even drop. The purpose of the Breakthrough Fund is to arm you with the tools to accomplish what you never imagined possible. Don’t think of this so much as a grant opportunity as risk capital. So, go ahead and think bigger, maybe as big as you possibly can—we dare you. 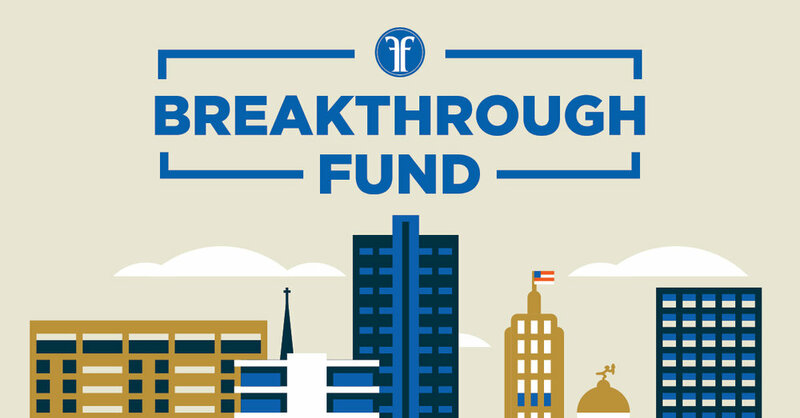 Learn more about the Breakthrough Fund. Read our last blog post: Breakthrough Resources for Breakthrough Ideas. Contact us for more information at 260 422-2900. When you're asked to solve a problem, how do you get to the solution? Check out lateral thinking for a new or refreshed perspective.